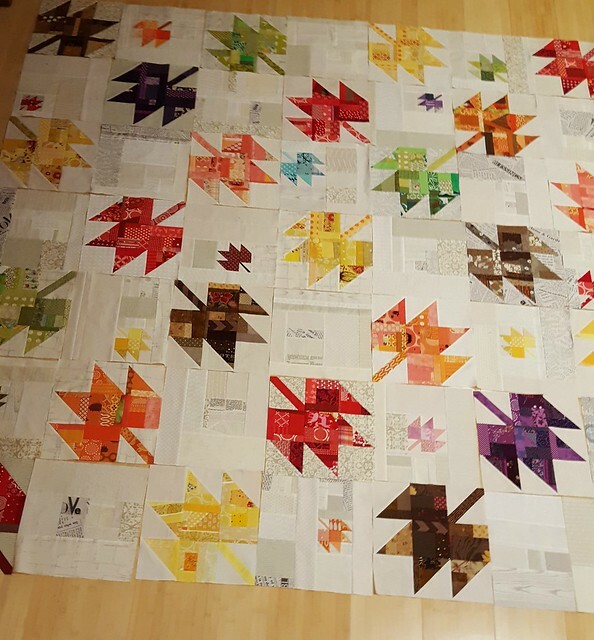 I'm just going to list one project for my Q4 Finish-along goal: my king size Maple Leaf quilt. This is a phone pic from 2 weeks ago and this whole thing is all sewn together as of last night, 49 blocks and 84" square. I'm planning and still cutting out the 6" border around all 4 sides. I have backing fabric, I hope enough but I'm not sure. I need to order batting. And probably more basting pins. Last time I made a quilt this big, I basted batting into the middle third of the quilt, quilted that, then hand basted batting onto one of the sides, quilted it, and then finished the final third. I'm not sure how I'll proceed this time but I'm sure I'll figure it out. I've been almost exclusively working on this for the last few weeks (had to sew some Girl Scout and Boy Scout badges...) and it has made my sewing much less stressful than when I have several projects I'm thinking about and switching between. In the next little bit I'll also be sewing a special dress for my kiddo and altering a thrifted skirt I got for myself, but no other quilting projects until this one is done. Wow, this is just beautiful! Can't wait to see it finished. Wow, this quilt is stunning! I cannot wait to see it finished! Thank you for participating in the FAL, on behalf of the 2016 global FAL hosts.